Florida Man Airs Grievances With Festivus Pole In Capitol On Wednesday, Chaz Stevens' beer can-covered pole joined a number of other displays in the state Capitol in Tallahassee. There are also a religious Nativity scene and an atheist display. Stevens says he's protesting what he sees as a flagrant disregard for the separation of church and state. 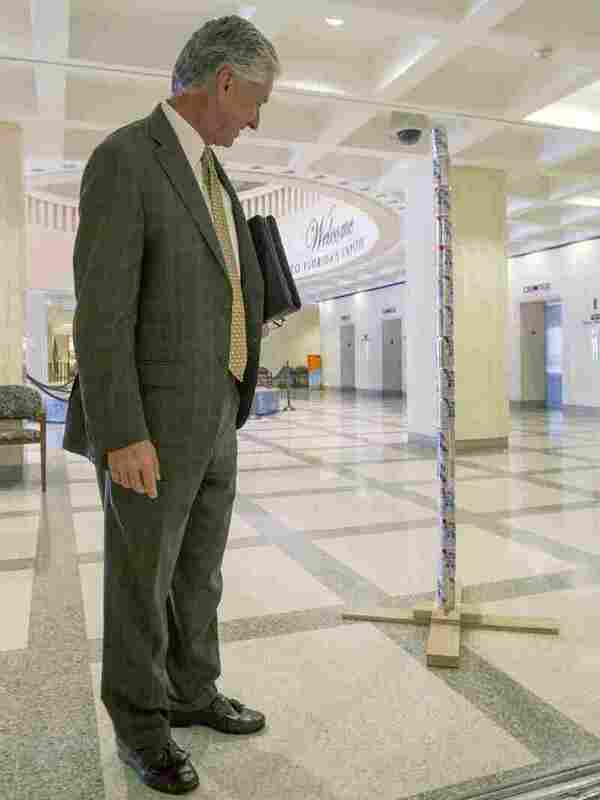 Florida lobbyist Keith Arnold stops to look at Chaz Stevens' Festivus pole made out of beer cans in the rotunda of the Florida Capitol in Tallahassee. "This whole thing is just a serious feat of ... ridiculousness," says Chaz Stevens, who marched into the Capitol building on Wednesday morning clutching a case of empty Pabst Blue Ribbon beer cans and a 6-foot pole made of PVC pipe. It's a nod to the unadorned aluminum pole that is part of the secular Festivus holiday invented by George Costanza's dad on Seinfeld. The celebration also includes an "airing of grievances" during the family meal, in which each person describes disappointments experienced over the course of the year. Stevens says when he heard about the Capitol Nativity scene, it was just too much. So he applied to the state to install his own display: a pole covered in beer cans. "This is about separation of church and state," Stevens says. "The government shouldn't be in this business of allowing the mixture of church and state." The displays are allowed inside Florida's Capitol building because the state has designated the rotunda as "a public forum." Howard Simon of the Florida chapter of the American Civil Liberties Union says the state had no choice. "They're not going to be allowed to discriminate. It's going to be a public forum for all forms of speech and expression and displays," Simon says. In fact, Florida has a pending application from a group called the Satanic Temple. Simon says it's unconstitutional for government to put up Nativity scenes because that's sponsorship of religion. So these public forums tend to become free-speech "battle zones." We are taking a stand for Christ in Christmas, a stand for truth and religious freedom, and what better place to do this than the heart of our state government? Andrew Seidel of the Freedom From Religion Foundation says that's what happened in a Loudoun County, Va., courthouse two years ago. "I think it was something like nine or 10 atheist displays went up. One of them was a crucified Santa. One of them was the Flying Spaghetti Monster," Seidel says. Seidel says it all started when elected leaders there allowed a Nativity scene on public property. He says cities tend to close forums after such displays appear. "When a religious group seeks to co-opt the power and the prestige of the government for their religious message, the best way to dilute that co-opting of the power and prestige is to put up our own message." His foundation's banner at the Florida Capitol says "Happy Winter Solstice." Below that is a drawing of the Founding Fathers and Statue of Liberty worshipping a just-born Bill of Rights. He says the banner was a response to the Nativity unveiled with a worship service two days earlier by Florida Prayer Network Director Pam Olsen. "We are taking a stand for Christ in Christmas, a stand for truth and religious freedom, and what better place to do this than the heart of our state government?" Olsen said. Olsen says the Chicago-based group that sponsored her celebration aims to put a Nativity at every state Capitol. Stevens says he and his pole are up for the challenge. "I'll see all 50 Capitols then," Stevens says. "Why not? Sponsored by Pabst Blue Ribbon." No word yet on whether Florida accepted the Satanic Temple application.